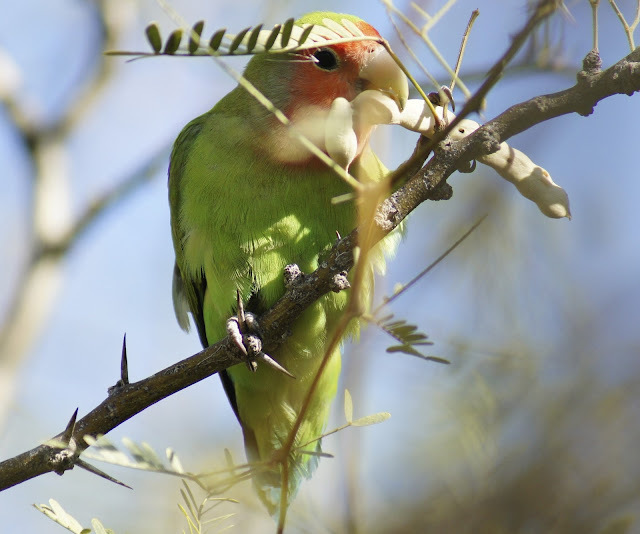 Of all the desert specialists to be found throughout North America, perhaps none is so colorful or vivacious as the Rosy-Faced Lovebird. 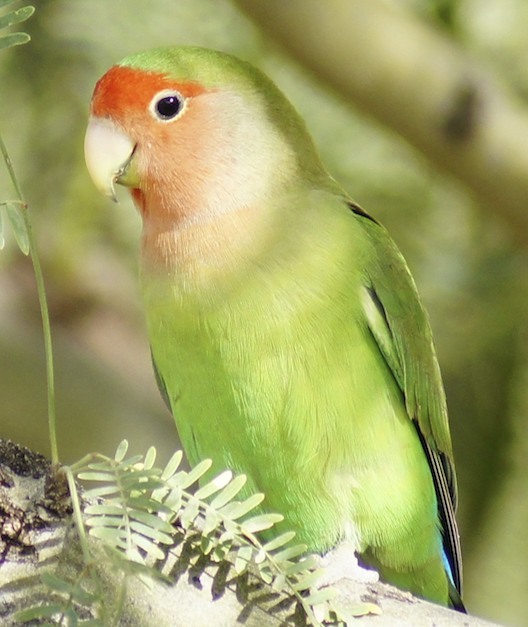 Also known as the Peach-Faced Lovebird, this small and extremely social parrot is a native of the west African deserts, but in recent years has established populations in Florida, California, and Arizona. Gregarious by nature, the Lovebirds get their name from their monogamous mating and affection for sitting and cooing in pairs for the greater part of an afternoon. 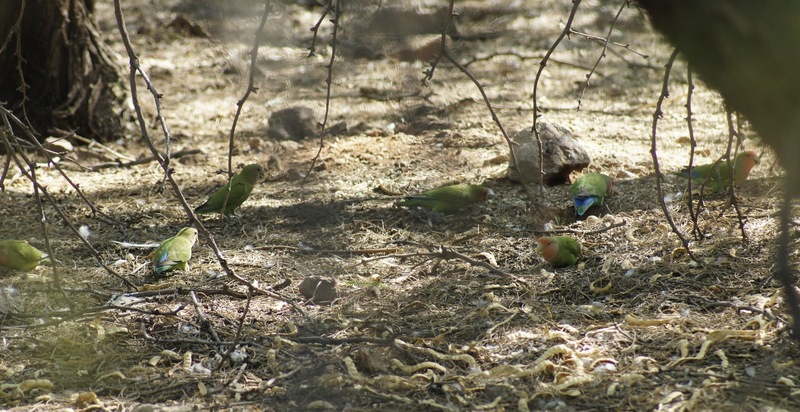 Compared to the extremely arid Namib Desert in Africa, Arizona must seem like a tropical paradise to the Lovebirds, and their population in the Phoenix area has been growing exponentially these last few years. I remember occasionally seeing or hearing a Lovebird along the Phoenix canals as a kid, when it was still a pretty uncommon and cool sighting. While seeing the Lovebirds some ten years later is still very cool, they can now be found all over the Metropolitan area, and they're just as consistent a sighting at any of the city parks as Abert's Towhees or Curve-Billed Thrashers. With their ability to adapt and excel in the Phoenix habitats, their population will only continue to grow. The Lovebirds have not made the official ABA bird list yet, and they're also excluded from various field guides despite the inclusion of other non-native and even less common species. However, they're fast becoming one of the staple and eye-catching birds of the Phoenix area. The Desert Botanical Gardens host substantial Lovebird clans through the warmer months, and provide them with a number of different habitats. This group was contentedly foraging among the fallen mesquite seeds, seemingly oblivious to the idea of other desert predators. They can also be found among the sunflowers, eucalyptus, and fig trees. While providing feedback to my post, Robert Mortensen mentioned that he birded the DBG regularly in 2006-2007 and never saw them, so this must be a pretty recent development. The Lovebirds are some of my favorites to see at the Gardens because they have an immediate WOW factor. I can introduce other bystanders to the Lovebirds with a much more satisfactory reaction and interest then when I point out a Thrasher or Towhee. Their loud colors and behaviors are immediately endearing to even the most aloof DBG patron, and I daresay they serve as a great gateway into the birding world. 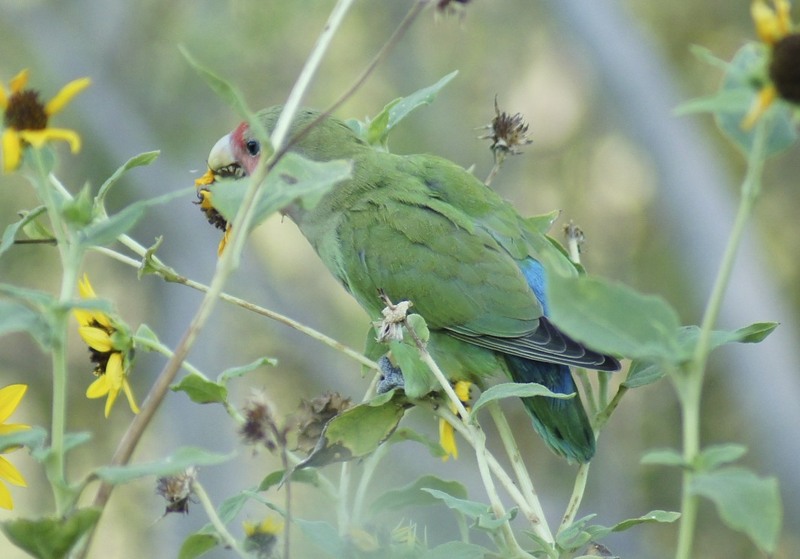 I've heard some pretty endearing stories about the DBG Lovebirds from the weekend docents that speak to the birds' charming and sometimes disastrous devotion to their little communities. Apparently, the DBG Lovebirds have not adapted well to the dense and treacherous cholla cactus that abounds in the Arizona desert. When one Lovebird gets stuck in the thorny mesh, his buddies will all cheerfully fly in after him, either to help extricate the poor bird or just keep him company. On what must have been a very somber Saturday morning, they removed eight dead Lovebirds from the same cholla. I find this behavior to be totally adorable. 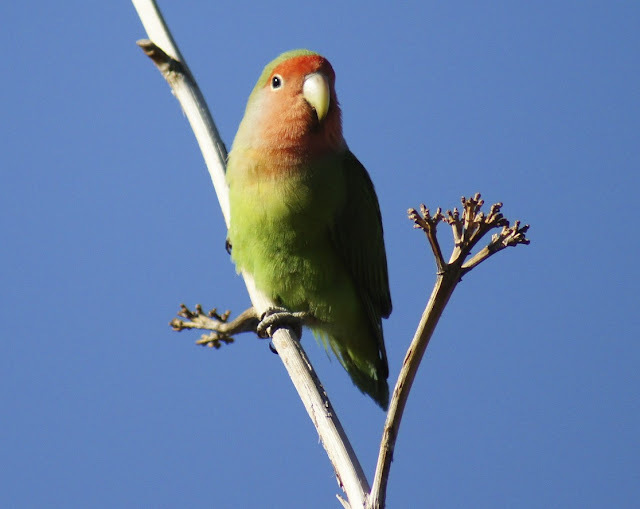 I'm not sure if the difference between Rosy-Faced and Peach-Faced Lovebirds is simply one of perception or naming preference. Some birds certainly seem to have a much darker red on their foreheads, which may designate them as rosy when contrasted with the duller peach colored birds. The rich green is maybe the most eye-catching attribute--uncommon as it is in the desert--and just to make sure they appeal from all angles, they've got nice blue rumps too. 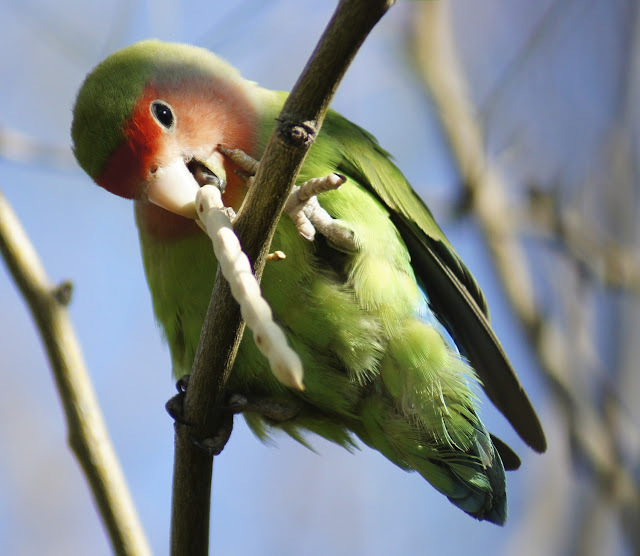 Other variations of Lovebird have been bred for domestic pets. 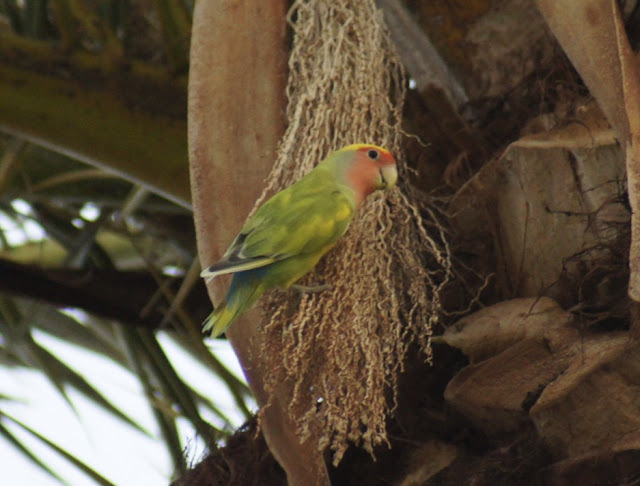 The Lutino Lovebird is probably the most common, and it is predominantly yellow on its body instead of green. 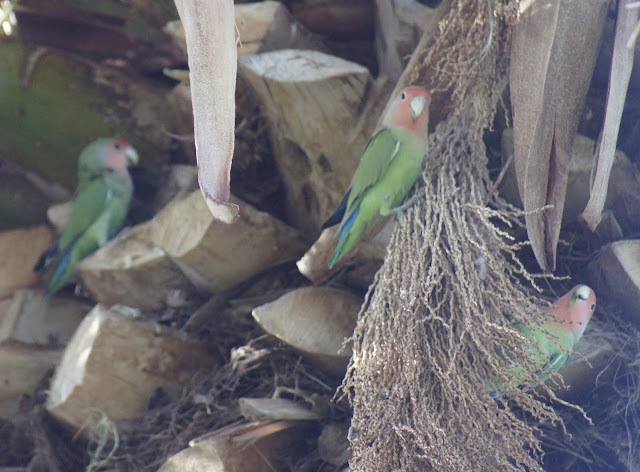 I have not seen a full Lutino outside of captivity, but did see one Lovebird that appeared to have some yellow mottling, meaning it was perhaps a second generation or something. These last couple of photos are the most recent. Far removed from the figs and eucalyptus that they enjoy so much, these Lovebirds were happily foraging in the bermuda grass on a soccer field. Imagine having these colors wandering all over the Phoenix parks; soon it'll be the most colorful city in the U.S! very nice post, great information and photos. I agree. What a cool looking bird, exotic or not. I enjoyed them at my backyard feeders when I lived in Mesa and the only other place I would see them back in 2006-07 was the Gilbert Water Ranch. Sounds like they are expanding. I wonder if any studies are being done regarding them taking over nesting cavities of Screech-owls or woodpeckers. I'm sure they are competing with Starlings too, which is okay by me. They're always a treat to see when I'm up in the Phoenix area. Great photos! Thanks for sharin' the "Love" y'all. This is such a sweet and sad story. talk about devotion! Oh MY! These birds should get an award! Though I lived in AZ for 3 1/2 years and birded Gilbert Water Ranch 2 or 3 times I was never able to spot these birds. Perhaps one day I will return and then be able to find them. I hope so! Such cute photos!